Local musical theatre company Get Your Wigle On are busy in rehearsals for their first musical extravaganza of the year, The Addams Family, and have gathered together a fantastic cast of experienced local talent for the production. The Addams Family is the laugh out loud musical comedy smash based on the famous kooky family that has audiences jumping to their feet! Fresh from its hugely successful UK tour the local cast of performers are working hard to bring this fresh new production to Shropshire. The Addams Family features an original story, and it’s every father’s nightmare. Wednesday Addams, the ultimate princess of darkness, has grown up and fallen in love with a sweet, smart young man from a respectable family – a man her parents have never met. And if that wasn’t upsetting enough, Wednesday confides in her father and begs him not to tell her mother. Now, Gomez Addams must do something he’s never done before – keep a secret from his beloved wife, Morticia. Everything will change for the whole family on the fateful night they host a dinner for Wednesday’s ‘normal’ boyfriend and his parents. It’s the perfect musical for the ‘Wigles,’ who are known locally for previous productions Grease, Sister Act, Hairspray and CATS to name just a few in a long list of shows they have performed in Theatre Severn. The company of all local performers have been working hard in rehearsals in their Shrewsbury studio to bring the music and lyrics to life. Michelle Hicken plays Moritia Addams, a role made famous by Anjelica Huston in the 1991 film. Michelle joined the company for their production of Witches of Eastwick and has gone on to wow audiences as Nancy in their 2014 production of Oliver and Vi in Footloose. The soundtrack is filled with a mixture of uptempo musical numbers, ballads and extended dance sequences that will be brought to life by a live local orchestra and features songs including ‘Pulled’, ‘Full Disclosure’ and ‘When You’re An Addams’. 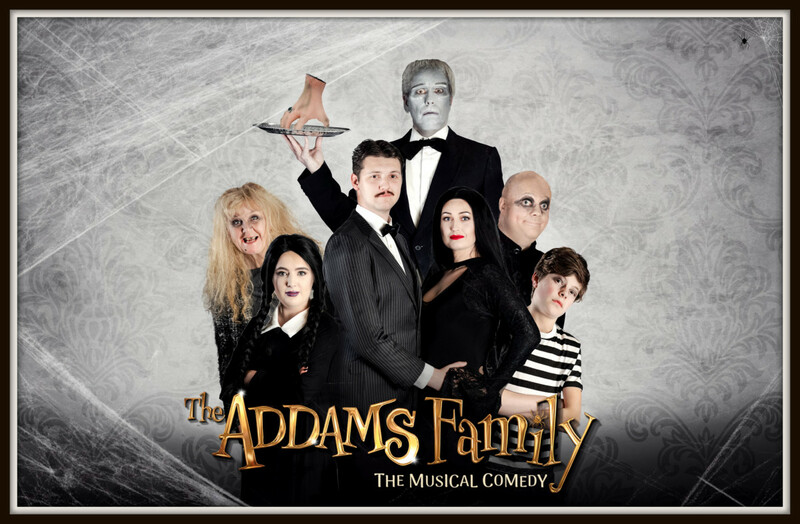 Addams Family is being performed at Shrewsbury’s Theatre Severn from Thursday 14th – Saturday 16th February with performances nightly at 7.30pm and an additional Matinee at 2.30pm on Saturday. Tickets available from £13 at www.theatresevern.co.uk or by calling the box office on 01743 281281.